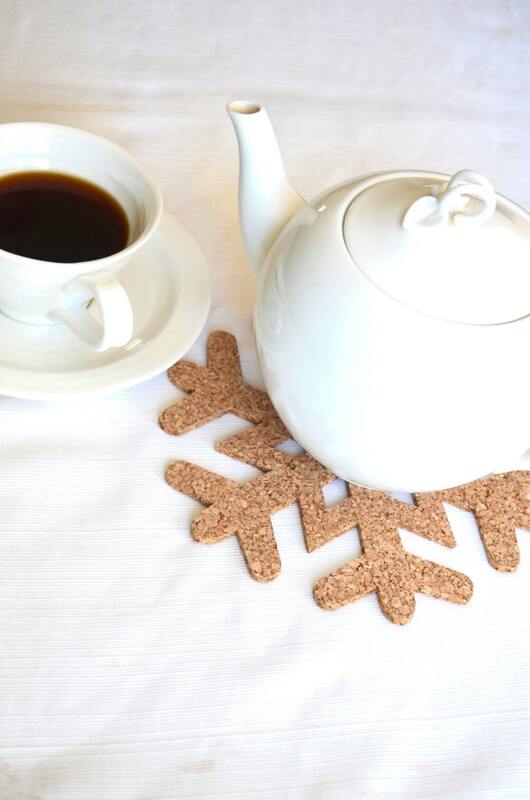 Snowflake Cork Trivets - set of 2 large snowflakes, packaged to use or gift! 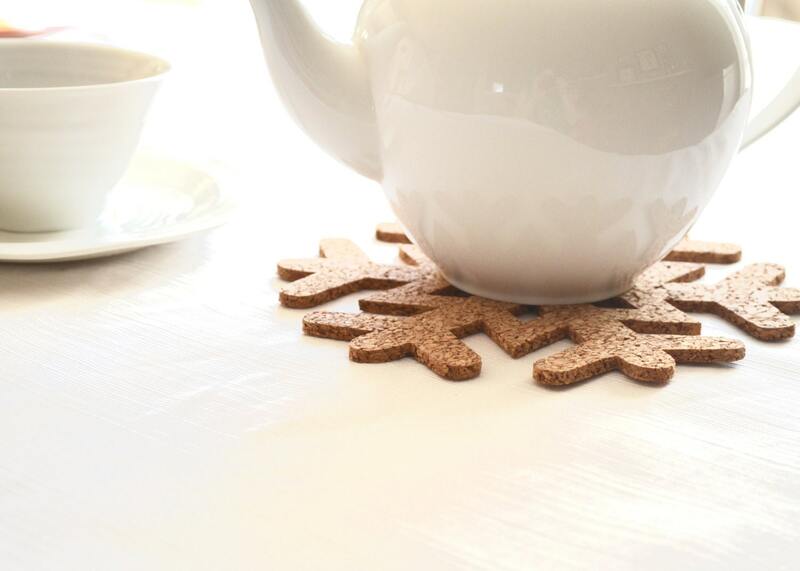 Decorate (and protect) your table top or counter with these festive snowflake shaped trivets! They will add an instant bit of wintery cheer to your home, and are equally suited for being used as a centerpiece on your table or holding hot pans of cookies in your kitchen. 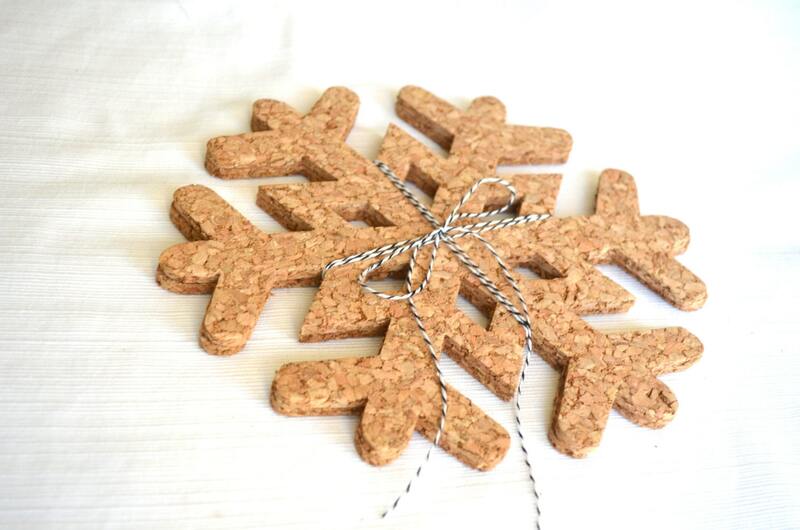 This pair of cork trivets come tied with classic twine, ready to gift or use in your own home. 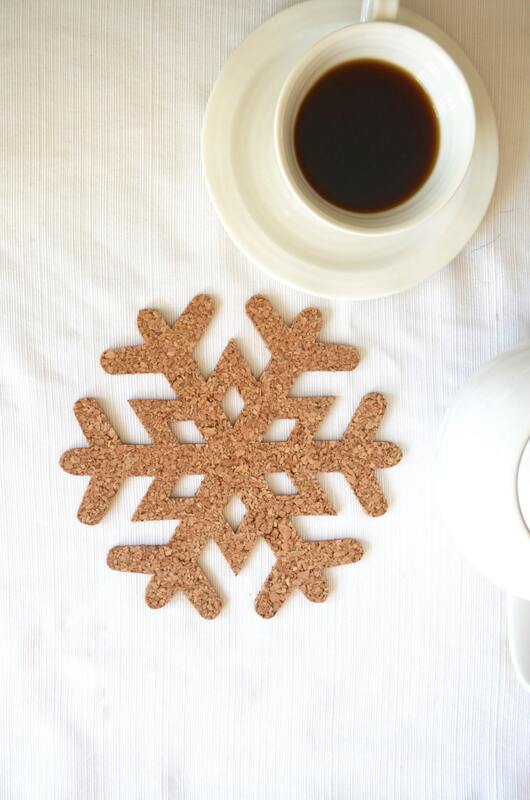 Each cork trivet is handmade from natural cork and measures 8" (20 cm) x 8" (20 cm). Please note that, because these coasters are made from natural materials, there may be some subtle variations in color. Below are some but not all of those privacy policies. For more information regrind specific privacy policies, please contact us directly using the information below. The terms "I", "We", "Us", and "Our" described in the following policy refer solely to the The Path Less Traveled LLC. To fulfil your order, you must provide us with certain information (which you authorized Etsy to provide to us), such as your name, email address, postal address, payment information, and the details of the product that you’re ordering. You may also choose to provide us with additional personal information (I.E. name to be personalized on a product, etc), if you contact us directly. - As needed to provide our services, such as when we use your information to fulfil your order, to settle disputes, or to provide customer support. - When you have provided your affirmative consent, which you may revoke at any time. For example, siding up for blog updates or promotional emails. - Service providers. We engage certain trusted third parties to perform functions and provide services to our shop, such as delivery companies (I.E. USPS, FedEx, UPS, etc). We will share your personal information with these third parties, but only to the extent necessary to perform these services. - Business transfers. If we sell or merge our business, we may disclose your information as part of that transaction, only to the extent permitted by law. - Compliance with laws. We may collect, use, retain, and share your information if we have a good faith belief that it is reasonably necessary to: (a) respond to legal process or to government requests; (b) enforce my agreements, terms and policies; (c) prevent, investigate, and address fraud and other illegal activity, security, or technical issues; or (d) protect the rights, property, and safety of our customers, or others. We may store and process your information through third-party hosting services in the US and other jurisdictions (For example, purchasing a shipping label via a third party, contacting you via email hosted on a third party server, etc). As a result, we may transfer your personal information to a jurisdiction with different data protection and government surveillance laws than your jurisdiction. If we are deemed to transfer information about you outside of the US, EU, or other jurisdiction we rely on Privacy Shield as the legal basis for the transfer. - Access. You may have the right to access and receive a copy of the personal information we hold about you by contacting us using the contact information below. - Change, restrict, delete. You may also have rights to change, restrict our use of or delete your personal information. Absent exceptional circumstances (such as, our requirement to store data for legal reasons) we will generally delete your personal information upon request. Please note that our ability to change, restrict, or delete information only applies to information we retain. Your information may be retained by others involved in processing transactions (including Etsy, USPS, etc) and they must be contacted directly. - Object. You can object to (i) our processing of some of your information based on our legitimate interests and (ii) receiving marketing messages from us after providing your express consent to receive them. In such cases, we will delete your personal information unless we have compelling and legitimate grounds to continue using that information or if it is needed for legal reasons. - Complain. If you reside in the EU and wish to raise a concern about our use of your information (and without prejudice to any other rights you may have), you have the right to do so with your local data protection authority. For purposes of EU data protection law, we, The Path Less Traveled LLC, are the data controller of your personal information. If you have any questions or concerns, you may contact us at: Contact@ThePathLessTraveled.com. Most of our items can be customized to meet your needs. For basic customization, simply leave a note with your order about the changes. For more detailed changes, please contact us before placing your order. Our belt sizing is NOT based on pants size, but rather a specific measurement that can be found by measuring a person's current belt. Please using the guide in picture #2 of our belt listing for more details. If you have questions or need help, please contact us. All of our products arrive either wrapped in white tissue and tied with bakers twine or in a high quality cotton travel bag (belts, etc). For hygienic reason, earrings are NOT returnable. If the earrings are defective, we will replace them. If you are unhappy with them, please contact us and we will work to find a solution. No physical item will be shipped or received via mail. After payment is confirmed, Etsy will send an automated email to let you know your files are ready to download. To download, follow the Etsy email link or visit your purchase/order history on Etsy and next to the item(s) there will be a "Download Files" button. Click that button and follow prompts. Due to the electronic nature of this item, once the order is submitted, there will be NO cancellation or refunds. The files for each listing have been tested. Please make sure you are using the correct file format for your application. It is your responsibility to make sure the format works with your software/machine. If you are having problems, please contact us. The Path Less Traveled LLC is NOT responsible for delivery delays by the USPS, FedEX, UPS, other world wide carriers, or Customs delays in the receiving country. This includes weather delays. If you experience a delivery delay once your order has shipped, please contact the carrier with your tracking number for service. Once the package has been received by the carrier, they are responsible for delivery. We are here to help if needed. Shipping fees are non refundable once the order has been received by the shipping carrier. Estimated delivery times are exactly that, estimated times provided by the shipping carrier. For more detailed information, please contact us or the carrier before placing your order. Clean design at a good price point + very quick shipping during the holiday season. 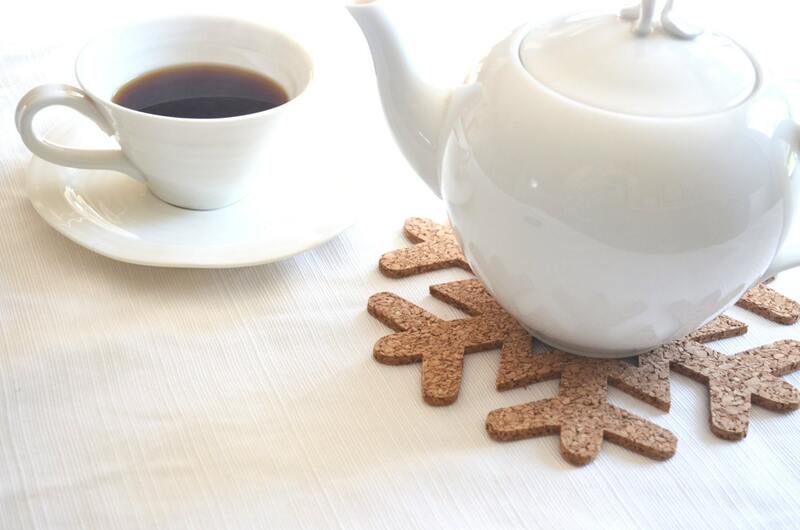 I love the size of these snowflake trivets. Thanks! Bought these as a stocking stuffer for Christmas and my daughter thought that they were great! I bought this for my Christmas day dinner and 3 others sets for gifts for my friends. They loved them! Very festive and will protect my dining room table. Ordered as a gift but I think I’ll keep them instead! Love!